News from the popular WEMPE Series: The PILOT III Series presents the modern and functional appearance. The LumiNova indexes and Arabic numerals are a fine contrast to the black clock face and can therefore be read with ease, even in the dark. The housing is 100mm in diameter and is made of stainless steel. 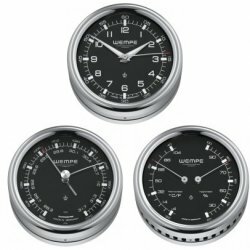 The WEMPE PILOT III Series includes a battery-powered clock with quartz movement. Over and above that, these is a barometer that shows the atmospheric pressure in hPa. The combined thermometer/hygrometer is one of our most popular products that displays the temperature in degrees Celsius or Fahrenheit on the left and the relative humidity in % on the right. You like the WEMPE PILOT III Serious but you like white clock faces better? Check out our PILOT V Series!